I highly recommend Zenergy dog training! K and RJ are amazing. 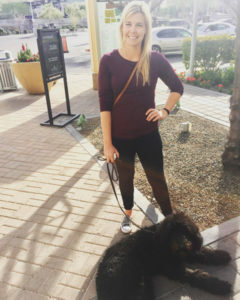 My 8 month old golden doodle, Lucy, had become very fearful of strangers and I was worried she would eventually bite someone out of fear. Taking her in public had become very difficult. On top of that she had endless energy at home and would chew shoes. After the boot camp Lucy is a whole new dog and I am a whole new dog owner! At home Lucy is calm and behaved and I am less stressed. We can go in public and strangers can pet her and I’m not worried she will bite them. If she does become afraid I now have the tools to help her. K and RJ sent pictures, videos and updates while Lucy was with them. They also provided all the help I needed and answered my endless questions once I brought her home. Sending her to Zenergy was the best decision I could have made!